Added exception handling for custom/undefined coordinate system, and Layout view. The Bing and Google Maps Python Add-in allows you to click a location in ArcMap, and then your browser will open to that location in one of the Bing or Google Map styles. If the toolbar didn’t automatically add to ArcMap, go to Customize –> Toolbars –> and click on Bing and Google Maps. 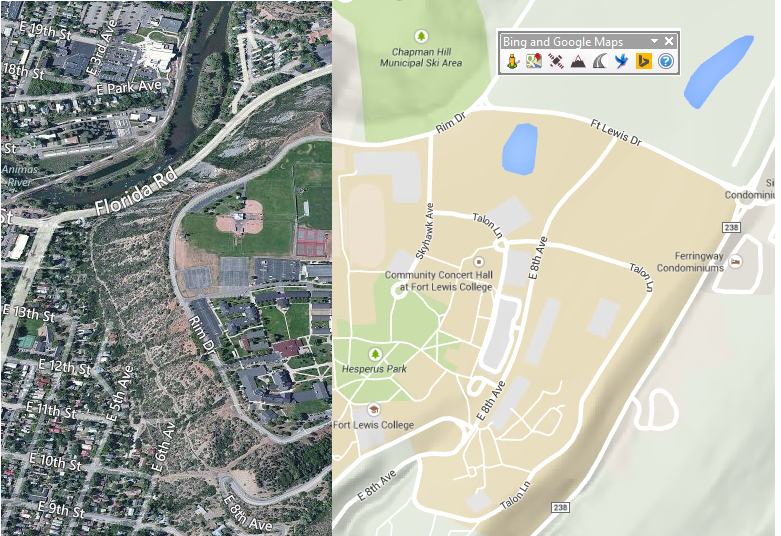 I attempt to match the extent of the display in ArcMap to the extent shown in Bing or Google Maps. I’ve recently found out the add-in will not work in Layout view, so I’ve added a warning message to alert the user. I’ve also added a warning message when the Data Frame coordinate system is either undefined, or uses a custom coordinate system. What happends when the dataframe coordiate system is unset?! Thank you for this. It is a fantastic tool. It seems google may have updated their street view URLs and as a result the street view button doesn’t work anymore 🙁 – all the others (Google + Bing) still work. This tool is a must-have, but I’m having issues when I use streetview, it just sends me to google aerial. Please update! This is amazing. I’m using ArcMap version 10.4. After downloading this tool, it was added easily. Very handy. Thank you Ian. Hi May, glad you find it useful, thanks for the comment! The Arc Desktop works perfectly and the links actually open in my default browser (I had problems with ArcGIS only using IE). Is there any way that we could get an Arc Pro version? Hi Matt, thanks for the comment, and I’m glad it’s working for you. I currently don’t have any plans to create an ArcGIS Pro version, but maybe someone else already has? We are on ArcGIS 10.2.1 and this tool is working for some users but not for others. They see 2 x-ed out circles in the toolbar. Is there some MS or Python component that needs to be added? Hi Lakshmi, I’ve sent you an email, but this usually means Python is not installed, or the Windows environmental variables are not setup correctly. Where is Bing Streetside??? Can that be added? Previous version used to work with any coordinate system, that was very useful. if this will have same capability that would be awesome! Hi Kari, thanks for the comment! This tool should function the same as the other one. It converts whatever coordinate system you’re dataframe is in to WGS84. Finally figured it out…if the are multiple data frames in the gdb, the first (top most in TOC) data frame is a custom or unknown CS I get the error…just make sure the first data frame has known CS. Hi Terry, thanks for the comments. I just saw your posts. I’m glad you figured it out, and thanks for letting me know the solution! tool is great! I am also interesed in developing add-ins with python. Just wondering will You publish the code, it would be great example for learning? I love the tool! I’ve been working on developing something similar for the company I work for, but I believe I need to use our company’s Google client ID in order to embed Google maps in an enterprise application. Do you know anything about that? Or are you planning on publishing the code for this tool? Any plans for an ArcGIS Pro version? I don’t really use Pro yet, since we are required to be on 10.2. Once I’m forced to use Pro more, I’ll probably make a similar add-in available. I’ll shoot you an email if that day ever comes. Hi Ian, many thanks for the tool! I did notice that in the 10.3 addin version the bing maps streetview doesnt work, it just shows the aerial map (you then have to click through to get the streetview) is this how its meant to function? Do you have this addin for arcgis 10.5? Downloaded from ArcGIS Online. Worked with ArcMap 10.5. Thank you. Ola Ian, gostaria de agradecer pela bela ferramenta. porem estou precisando de algo mais especifico estou usando sua base. preciso muito da sua ajuda. Very handy toolbar. Any chance there could be a Google Earth button at some point? I realize this may be a different beast, since Google Earth is it’s own application, not a browser/web map. However I often head to Google Earth when I need to check historical imagery, and I usually end up copying lat/lon values from Google Maps over to Google Earth to quickly pan to a location.